I am an artist living and working in Sheffield, South Yorkshire. Currently, I am concentrating on printmaking, mostly lino cut prints. I am finding linocut printing to be such a flexible medium, presenting opportunities to explore pattern, texture and colour. I am developing a technique of applying inks with hand made leather 'dabbers' which enables a greater range of colours and density of ink to be achieved, producing subtle gradations of colour within each layer of printing. I always enjoy the physical process of carving and cutting the lino block, allowing the different cutters to produce marks and textures to build up the final design. 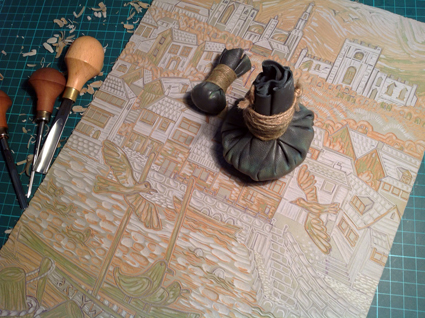 As I use the reduction technique, cutting away each colour on the same block, my prints are in limited editions. I also enjoy experimenting with printing the lino blocks onto different papers, combining watercolour, gesso, and digital giclee print to create interesting surfaces. These mixed media prints are individual one off pieces. There are so many sources of inspiration, but at the moment I would single out old railway posters and other graphic and textile designs of the 1950s. Much of my work currently is inspired by the coast of Yorkshire and Norfolk, but I have plans to develop ideas for my local Derbyshire countryside and Sheffield city itself. I am a member of the Sheffield Printmakers group, and have participated in group exhibitions with them in Sheffield.